The relentless search for a decent egg breakfast sandwich continues with an entrant from Starbucks. Some of you are probably sick of this by now (and you have told me MANY times to stop trying to buy a breakfast sandwich one and just make it myself - which I promise to do). But, I felt that I had to try the Egg, Cheese, and Ham breakfast sandwich from Starbucks to see how it compared to the Egg McMuffin since I had compared the two brands' oatmeal see here: Starbucks' Oatmeal vs. McDonald's Oatmeal - Which one should you choose?. Right off the bat, I am going to tell you that this sandwich is delicious. Like really delicious! So delicious in fact, that I worried about exactly what they put in the sandwich. Which leads me to a fact that I couldn't find out what was in this sandwich. I looked on the Starbucks' website and found nothing. The, I called them and they forwarded me to media relations and they didn't e-mail me back. So, I went with the nutritional information on the Bacon, Gouda Cheese & Egg Frittata on an Artisan Roll because it was similar to what I had. Which leads me to the other crazy thing about my Starbucks visit which was that the man next to me was eating a ham and egg bagel that he had brought in from a bagel place. I asked him, "Do you not like these egg sandwiches?". He replied, "I didn't even know they served them here." And, that was why I didn't even try the potentially healthier - Reduced-Fat Turkey Bacon With Egg Whites on English Muffin - that Starbucks also sells. Because, I didn't know they sold it! There was no list of breakfast sandwiches to choose from that I could see when I entered the store. Now, I'm not a marketing expert but I think it is a good idea to let your customers know of any potential products they might want to buy when they enter your place of business. Anyway, not to bash Starbucks, but McDonald's does do an excellent job of having all their nutritional information on their website (and they sent me free coffee coupons). Starbucks won't even call me back. Back to the sandwich, which was $3.79 and delightful. So, it has 840 mg of sodium, which is out of control and no fiber to speak of. So, this is a treat and should be used in emergencies. And for $2 more than the Egg McMuffin, you are going to have something delicious made with real ingredients like REAL cheese. If you are going to spend the calories and cash, this is your sandwich. Now, the sad part, is that the "reduced fat" sandwich isn't really that much better than the other fattier option. Why isn't this more like the Vitalicious Egg-n-Cheese sandwich? Is it because of the bacon? I will send this over to Starbucks to see if I can get a response. I'm not holding my breath because then I would turn blue and die. 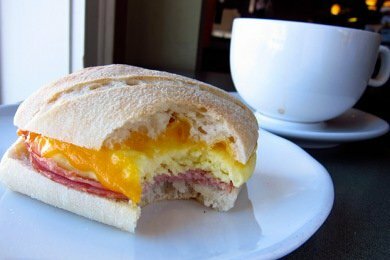 Have you tried the Starbucks egg sandwiches? Please share! I tried the Bacon & Gouda one a couple of weeks ago and I wasn't that impressed considering the price (but I only paid ~$2 since I bundled it with a drip coffee). I could have sworn the "frittata patty" tasted like it had sugar added. Serious question: what makes a bread roll "artisan" or "rustic"? Funny thing about these sandwiches, they have been offering them in select stores for going on 5 years.....when we were in Reston, Virginia in 2008 they had my hands down favorite, a spinach, havarti herb egg english muffin......it was the best.....but they stopped offering it later that year and when the sandwiches appeared in our local area, nevada and california ...it was just the sausage patty muffin or the reduced fat turkey bacon, neither are tasty in my opinion....they are now offering a new artisan bacon and gouda and a veggie feta thing.....neither are flavorful, your ham looks fabulous and i would order that, if only they offered it in my local stores! I love the Spinach Wrap they have and it has much better stats. It is true though for a long time most of these sandwiches have been served only at select locations. I'm a fitness professional in Dallas, Tx. I just wanted to share some info with you. Some Starbucks here (not all, maybe the larger ones)serve breakfast and there is one that you should try. It's a egg spinach wrap. You can look up the ingredients for total accuracy, I just remember that it was yummy and fairly healthy. It's something like scrambled eggs, spinach, roasted tomatoes, and maybe a white cheese on a whole wheat pita or tortilla. Let me know if they have them in your area and if you like them. interesting that they didn't list the sandwiches anywhere- you think starbucks would have marketing down! For the record, the reduced fat turkey bacon sandwich and the Spinach, Feta and Egg white Wrap at Starbucks are both delicious. All of the sandwiches and wraps that are available at all of the Starbucks I have been to have been displayed in the glass cabinet with the other food offerings....there is usually a list as well as the sandwiches themselves. I've only had this once. I prefer the sandwiches or the snack plate with the apples. Thanks for weighing in on these! I figured they aren't "healthy" but they taste like real food (vs. getting one from Dunkin Donuts) and are really yummy. I had no idea the sodium content was so high though! I'm always shocked at how much sodium is in prepared foods! Thanks for posting this info. I am sticking with the 150 calorie VitaSandwich. Especially after the company posted the new heating instructions online, the sandwich tastes even better. I love the breakfast sandwiches at Starbucks. They taste great and some of them are relatively healthy. However, on two occasions, I have had the ham, cheese and egg white sandwich. Both of these times I have gotten stomach sickness shortly afterwards. I do not consider myself to have a sensitive stomach, which leads me to wonder what really is in these sandwiches!? Has anyone else experienced this? I'm going to look for these! I tried the bacon, egg and gouda for the first time today and was pretty disappointed. The bacon was so minimal that half my sandwich was just egg and cheese. The bread was pretty tough, especially on the edges. And it just didn't have much flavor to it, except salt. Next time, I forget my breakfast, I'll take the time to walk a couple of block to get something better tasting, less expensive and more filling. I've been sitting in Starbucks since this monring. Usually I eat oatmeal - I LOVE IT, but like to switch up occassionally. I am on Weight Watchers and calculating my points plus . No one here know the 'amount' of bacon on the Reduced-Fat Turkey Bacon With Egg Whites on English Muffin. Looking at it maybe 1.5 strips. Anyone know for sure? I want to recalculate pts eleminating the bacon. The Spinach, Feta, & Egg White Wrap is one of my favorites! It's delicious, filling, and has pretty impressive stats for a "fast food" breakfast sandwich. Hey! My colleague has recommended me to read your site. And I’d like to say that I really respect what you’re providing here. Thanks for this entry and for your site on the whole. I’ve just subscribed to your news feed.